Like most food lovers, I adore sushi. And like anyone who is a living, breathing human being, I'm a pretty big fan of sriracha sauce. I guess you can see where this is going. Yes, sriracha sushi, which I've decided is my new favorite thing. I discovered how to make sriracha sushi one day while I was dehydrating the sauce for sriracha powder. Now I'm addicted and make it all the time. It's the perfect snack, and I'll teach you how to quickly and easily make it. A quick note to the sushi purists: sriracha sushi is no replacement for real sushi, but it's a fun and playful alternative. I've found that I can't make anything near restaurant-quality sushi at home, so I'd rather try something fun and different than fail at the real deal. So if you're looking for traditional homemade sushi, this is not the tutorial for you! But if you want something that will give your taste buds a new dance, this is it. 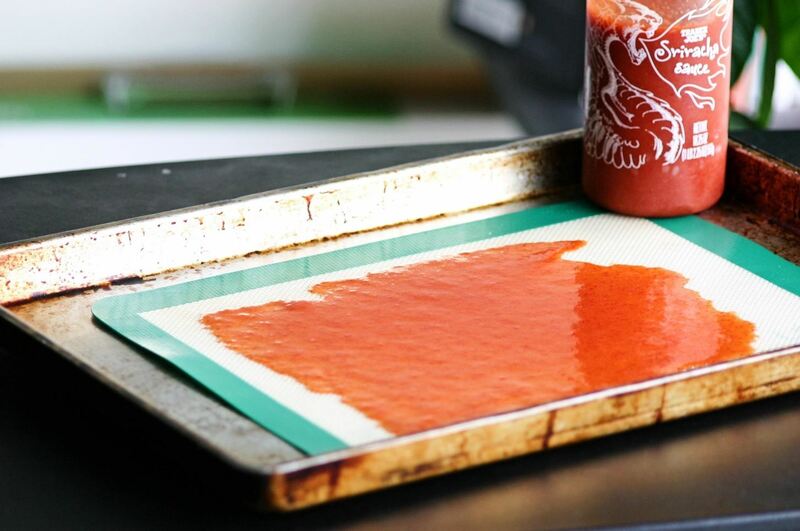 Preheat your oven to 200°F, and spread a few tablespoons of sriracha onto a Silpat or a sheet of wax paper, then place that on top of a baking sheet. Tilt the pan back and forth until the sriracha has formed a large, thin sheet. Put it in the oven for about an hour and a half (it may need a bit longer depending on your machine). When the sheet is done, it should be completely dry, but not yet brittle. The goal is for it to resemble a sheet of nori: bendable but not easily breakable. Start by making some sushi rice (you can learn how to make it perfectly here). 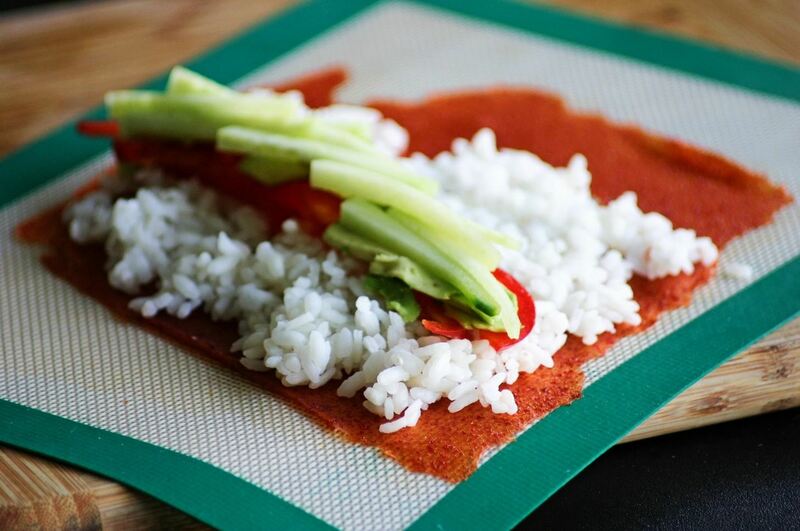 Spread the rice across your sheet of Sriracha, but leave an empty strip at one end of the sheet. Then add a row of whatever ingredients you want. I've found that the spiciness and sweetness of the sriracha is strong enough that it overpowers delicate seafood, so I only use vegetables when I make Sriracha sushi. You can obviously use fish, but it probably won't be worth the price. My favorite ingredient for sriracha sushi is avocado; the creaminess perfectly balances out the spicy sriracha outer layer. Plus, it's avocado! 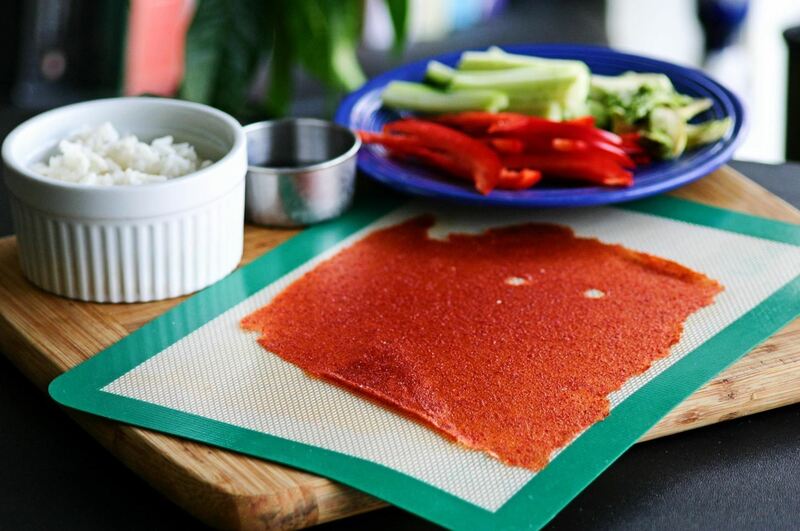 Roll your sriracha sushi just like you would roll normal sushi, though I recommend keeping it on the Silpat so that you can roll the sushi with the silicone, instead of with a traditional sushi mat. 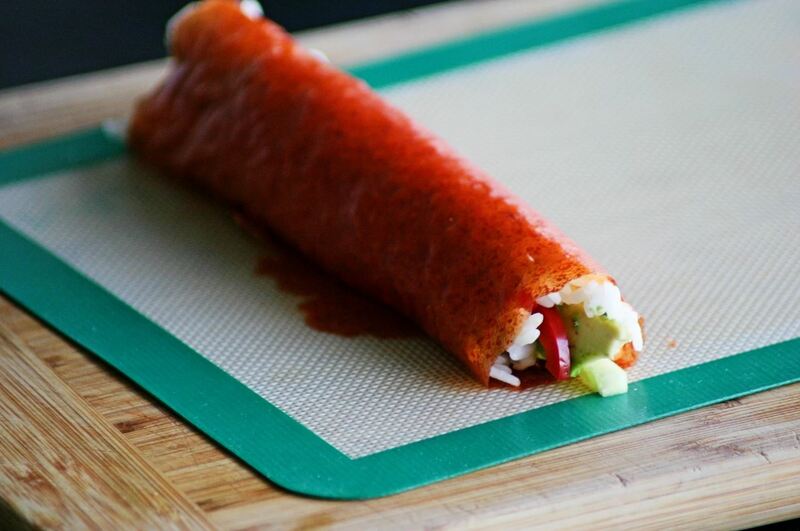 After you've rolled it up, dab a little water along the bare strip of sriracha and seal the roll. Now comes the fun and hard part: eating the sriracha sushi. I've found that unless you cook the sriracha to the perfect amount of doneness, it's likely to rip when you try and cut it. So I recommend eschewing cutting (and sharing), keeping the roll whole, and eating it like a wrap. However you eat it, you'll enjoy it. It's a great snack to make for your friends; I can guarantee that they've never had it before!